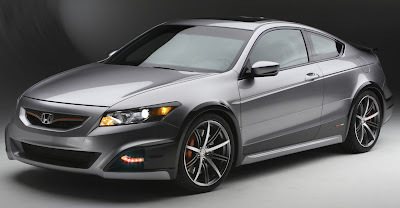 Albeit less impressive than the Accord Coupe HF-S Concept that we showed you yesterday (click here), the Accord Coupe HFP is a nicely customized vehicle that’s sporty but not flashy. It is equipped with dealer-installed Honda Factory Performance (hence the name “HFP”) components including a sports suspension package, 19-in. alloy wheels in 245/40R-19 rubber and a full aerodynamic body kit (front, sides and rear). Press Release: As a dealer-installed accessory, Honda’s in-house HFP products carry the same 3-year/36,000-mile bumper-to-bumper warranty as the rest of the vehicle, when installed at the time of new vehicle purchase, and are engineered to be fully compatible with the vehicle. The Accord HFP package includes a wide range of performance- and style-enhancing products. The Sports Suspension package (available Spring 2008) reduces ride height by about 25 mm, lowering the vehicle’s center of gravity, and enhancing the Accord Coupe’s sporty road-handling characteristics. Larger wheels and tires include 19-inch, 10-spoke alloy wheels designed for high-performance 245/40R-19 tires (sold separately). A full aerodynamic body kit (front, sides and rear) further elevates the style quotient of the entire vehicle. Interior and exterior HFP emblems complement the package. All of the Accord Coupe HFP components except suspension can currently be purchased individually, and the full HFP package including suspension will go on sale in the spring of 2008. American Honda launched its performance accessory program in 2002 with the introduction of a Honda Factory Performance package for the Civic EX Coupe, and currently offers HFP products for the Civic, Accord and Fit. Ron English, a New York-based painter, billboard liberator, and toy designer has collaborated with Scion and several tuners to create a somewhat different customized tC Coupe. Painted in a custom purple pearl color and featuring electroluminescent lighting animating Ron English’s ying-yang artwork the tC is unique in its own weird way. And because this is SEMA and not an art gallery, the tC sits on 19-in. alloy wheels complemented with 3/4″ lowering springs by Eibach. Shawn Williams from Street Concepts, created a customized version of Hyundai’s flagship sedan model dubbed the “Vip Luxury Tuner”. Considering what he had to work with, Shawn did a pretty good job with the Hyundai Azera that’s dressed in a bespoke white pearl paint and black suede seats with white stitching. The subtly customized Korean sedan also features a Eibach suspension, MagnaFlow catback exhaust, K&N intake and Brembo brakes. Take a very good look at the Mitsubishi Double Shotz concept pictured above; believe it or not, what you’re looking at is actually… a Hot Wheels toy car! As “mama” Mattel explained, in order to celebrate Hot Wheels’ 40th anniversary, it invited major carmakers to submit a series of concept ideas that would be turned into a line of 1/64 scale toy cars in spring 2008. Mitsubishi entered the Hot Wheels Designer’s Challenge with a proposition from Mitsubishi Motors Research and Design of America (MRDA) employee, Gary Ragle. Gary’s Double Shotz concept sportscar, that’s fitted with two 4G63 engines derived from the Lancer Evolution, was one of the seven winners in the Hot Wheels Designer’s Challenge. We wouldn’t mind at all if Mitsubishi decided to create a life-size concept of Gary’s proposition. October 30, 2007 — Cypress, Calif.
Toy manufacturer Mattel has announced that Mitsubishi Motors Research and Design of America (MRDA) employee Gary Ragle is among seven designer finalists to be selected in the company’s first-ever Hot Wheels Designer’s Challenge™. MRDA was among six automotive manufacturers to participate in the challenge, which marked the first time Hot Wheels has turned outside the company to seek new vehicle designs. Created to represent the ultimate Mitsubishi vehicle and the spirit of the brand’s future, the sleek design of Ragle’s Mitsubishi Double Shotz celebrates the 4G63 engine and the Lancer Evolution. “The design takes the concept of the Lancer Evolution to the next level and ties it in with the enjoyment and imagination of the Hot Wheels brand,” said Ragle. After being selected by a panel of judges that included editors from the Los Angeles Times, Car and Driver, and Men’s Journal, along with Hot Wheels designers and executives, the designs were unveiled at the Specialty Equipment Market Association (SEMA) Show in Las Vegas on October 30th, 2007. The Hot Wheels Designer’s Challenge product line will be available in stores in the spring of 2008. Ford’s second Flex concept for the 2007 SEMA Show (see the first one here) was penned by Funkmaster Flex. The designer supports that he has handed a sense of urban luxury to Ford’s new crossover –whatever that means. Dubbed Flex2, the concept features the same “Land Rover” styled fascia, a nice Brandywine body color combined with a faux-brushed aluminium roof and 22-inch forged alloy wheels. Inside, the Flex2 is fitted with custom seat covers with alligator print inserts and stainless steel color stitching on the seats and interior along with a high-end entertainment system. Hip Hop guru of car customization Funkmaster Flex brings his vision of urban luxury to Ford’s newest crossover with the Flex2. His signature two-tone paint scheme is integrated cleverly into the Flex2 through a House of Kolor Kandy custom paint job that features a Brandywine body color and a unique faux-brushed aluminum roof. Flex2’s exterior design is further enhanced by custom 3dCarbon accents including fender vents, upper and lower grilles and a rear upper spoiler. The all-black leather interior features Katzkin custom seat covers with alligator print inserts and stainless steel color stitching on the seats and interior trim. To keep the party going inside the vehicle, Funkmaster Flex added two Invision headrest-mounted DVD systems in the first and second rows, along with a JL Audio 12-inch subwoofer and amplifier to enhance the tunes. Flex2 rolls on custom 22-inch NC Forged wheels and Cooper Zeon XST tires. With a 1-inch lowered suspension and Borla dual rolled exhaust tips, Flex2 is an urban legend in the making. Making its world debut today at the SEMA Show in Las Vegas, the Honda Accord Coupe HF-S Concept attempts to demonstrate how far you can go with in-house tuning. “The Accord HF-S Concept provides a glimpse into the future of vehicle customization,” said John Mendel, executive vice president of American Honda. Built by Honda Access America, Inc. (Honda’s U.S. accessory development division), the Accord Coupe concept gets a stylish bodykit with carbon fiber panels, new bumpers and LED driving lights on all four corners. Additionally, the concept also features a dual-port exhaust system providimg extra power when needed along with an electronically controlled system that allows the driver to customize throttle response, suspension settings, steering boost, and traction involvement. Honda Access America, Inc., Honda’s U.S. accessory development team designed and built the HF-S Concept to demonstrate how the customized use of technology could allow vehicle owners to fine-tune performance while adding their own senses of style. Key exterior and conceptual powertrain modifications represent functional performance and driving-experience enhancements. Unique LED driving lights, placed on the fore-most corners, wrap around the front of the bumper providing increased visibility both forward and side for the driver while also creating a unique appearance. The shape of the front bumper is designed to create a vortex effect to enhance high-speed aerodynamics and engine cooling. On the sides of the vehicle, the shape of the carbon fiber panels decreases negative speed force around the wheel arches. The rear bumper diffuser is designed to reduce drag. The trunk spoiler is a prototype design engineered for high-speed down-force. The metallic color of the exterior is accented by Cadmium Orange Pearl – a color derived from super-heated metal. The use of this color for the brake calipers, badges, grille accent, and interior details underscores the vehicle’s high-performance appearance. Key to the concept is the use of technology to electronically customize throttle response, suspension settings, steering boost, and traction involvement to the driver’s taste. Additionally, the exhaust is a two-stage design. It is engineered to be exceptionally quiet during relaxed cruising, and provide elevated levels of performance in high performance driving situations.